You are required to activate your deployment of Volume License editions of Microsoft Office 2010. This includes Microsoft Office Professional Plus 2010, Microsoft Project 2010, and Microsoft Visio 2010. Activation reduces the possibility of deploying counterfeit software, which can include malware, viruses, and other security risks. Office 2010 supports Windows 8 and Windows Server 2012. If your organization has 50 or more computers that need to activate Office 2010, we recommend that you use Key Management Service (KMS). KMS activates the computers, or KMS clients, from a KMS host server that contains a KMS host key that is supplied by Microsoft. This method replaces direct activation through Microsoft, and gives the local administrator control of the process. The administrator can easily monitor computers on the network by using the Volume Activation Management Tool (VAMT) (http://go.microsoft.com/fwlink/p/?LinkId=183042). The following is an example of a network that can use KMS activation. Contoso, Ltd. has 175 desktop computers that are always connected to the corporate network and 50 portable computers that are periodically connected to the corporate network. The solution is to use KMS activation for both the desktop computers and the portable computers, and to make sure that the portable computers are connected for initial activation and at least every 180 days after that for reactivation. The following articles will help you make sure that your deployment of Office 2010 is properly designed for Multiple Activation Key (MAK) activation. To assess the Office 2010 environment, see Assessing the compatibility of Office 2010. To plan the desktop configuration for Office 2010 (if required), see Plan desktop configurations for Office 2010. To assess the system requirements for Office 2010, see System requirements for Office 2010. To review the KMS host server requirements, see Prepare and configure the KMS host in Deploy volume activation of Office 2010. To configure DNS for the KMS host, see “Understanding KMS” in Customer Hosted Volume Activation Guide (http://go.microsoft.com/fwlink/p/?LinkId=187539). At least five computers must request activation from the KMS host before KMS clients can become activated. 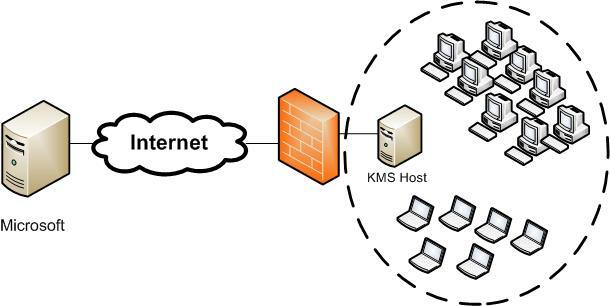 All KMS clients must connect to the KMS host at least one time every 180 days to reactivate. To obtain the KMS host product key for Office 2010, register on the Volume Licensing Service Center (VLSC) (http://go.microsoft.com/fwlink/p/?LinkId=184280) Web site. For the KMS clients, the product keys are preinstalled. The KMS host service is included as part of Windows 7 and Windows Server 2008 R2. Therefore, these two operating systems can be configured as a KMS host without having to install additional software. To configure an Office 2010 KMS host on Windows Server 2003, see To activate an Office KMS host on Windows Server 2003 in Deploy volume activation of Office 2010. Although you have six KMS host activations on the KMS host key, we recommend that you activate no more than one or two KMS hosts. To activate the KMS host on the Internet, run KeyManagementServiceHost.exe in the Microsoft Office 2010 KMS Host License Pack (http://go.microsoft.com/fwlink/p/?LinkID=169244). This is a free download from Microsoft. To activate the KMS host on the telephone or manually, and to configure the KMS host, use the slmgr.vbs script. For more information, see Deploy volume activation of Office 2010. When the KMS host is activated, existing KMS clients activate automatically. Certain instances require KMS clients to be configured by using the ospp.vbs script. For more information details, see Tools to configure client computers in Office 2010. Download and install the VAMT 2.0 tool (http://go.microsoft.com/fwlink/p/?LinkId=183042). Follow the instructions on the download page. For more information about how to use VAMT, click Help on the VAMT 2.0 menu bar. If you have five or fewer computers in a department or group that are not connected to the corporate network, we recommend that you use MAK independent activation for each computer. For more information, see Plan MAK independent activation of Office 2010. If you increase the number of computers to fewer than 50, we recommend that you use MAK proxy activation through VAMT for all computers that can connect to a MAK proxy server. For more information, see Plan MAK proxy activation of Office 2010. For an example of a scenario that requires KMS activation, see Scenario: Core network - KMS activation of Office 2010. For examples of scenarios that require KMS activation combined with MAK activation, see Scenario: Secure network - KMS or MAK activation of Office 2010, Scenario: Disconnected computers activating Office 2010, and Scenario: Test or development lab activating Office 2010.